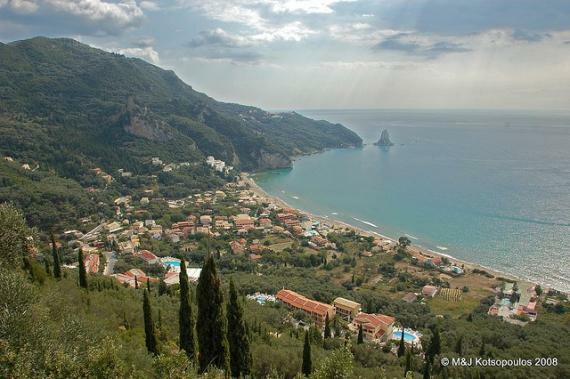 Agios Gordios is a small settlement at the west side of the island, 20 kilometers away from the center of Corfu Town. The large, homonym beach is located in a beautiful, natural environment with the Aerostatos rock on the north side, a former observatory, and the 'Ortholithi' on the south side, a majestic rock in the sea. It boasts one of the most beautiful beaches of Corfu, a golden sandy beach surrounded by cliffs with secret lonely parts. The north side of the beach is adorned by rocks that look like sculptures, while the southern end is dominated by a rock that is referred to in a novel by Iakovos Polylas. Find information about selected Hotels, apartments and rooms in Agios Gordios to choose the perfect place for your accommodation.